The 4th meeting of the World convention on beer collecting will take place on October 10-13, 2019 in the city of La Plata, Arngentia. 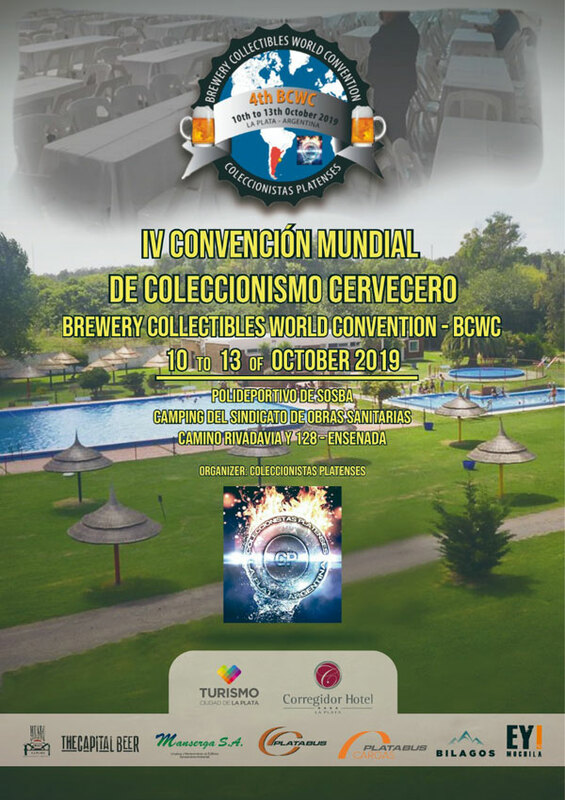 After tough negotiations with the city of La Plata hotels, we are able to send accomodation rates, very suitable to the personal economy of all participants to the fourth edition of the famous Brewery Collectibles World Convention - BCWC, to be organized in the city of La Plata between 10 and 13 of October 2019. The options are various, but I must warn you, first of all, that in the last few days we have had bad news regarding the availability of the necessary rooms for the big turnout as we wait for our maximum event. It has announced that a new edition of the National Congress of women, that in the latest edition of last month, more than 50,000 people attended in the city of Trelew, Argentina, will be made on the same date, here in La Plata. This implies that there will be a huge demand for accommodation that requires us to recommend immediate reservations by your gestion, because otherwise you will be without places, forcing to stay in Buenos Aires, which is 60 km away from this city with the inconvenience that this It will produce for all of you, if you wait for last-minute reservations. Attention! First we must let you know clearly, that the organization is NOT in charge of hotel reservations or intermediate to make them. You should communicate directly with the hotels, mentioning the codes that we explain here for access to the agreed special prices. Keep in mind that these rates shall be also applicable for days before and after the Convention for those who want to take advantage of the travel and tourism places. Please visit: www.welcomeargentina.com, www.welcomeargentina.com, turismo.laplata.gov.ar. This is a map of downtown La Plata where you have marked the location of different accommodation and the place were will take place the trade floor and main activities of the Convention: "Pasaje Dardo Rocha". Main Hotel of the IV BCWC , place of the closure banquet, and place were will be held the famous "room to room" of trading. Distance to the Pasaje "Dardo Rocha", 150 meters. This hotel gave us the best rate of the city that we believe is unbeatable, but only applies with prepayment prior, only way to secure the booking of accommodation, non-refundable. For payment by credit card and for passenger's safety, the card number has to be sent by e-mail and the security code by phone. Rate per night: double room: usd 75 + Tax (21%), tax refundable to foreign passengers when the check out is made, showing the foreign Passport. Breakfast included. The mentioned rate also includes Buffet breakfast, use of the gym and Internet service. Check in is 2 pm and check out 12 hs. The parking places can not be reserved and are obtained by order of arrival with an extra cost. (they are limited). About the rooms, they are equipped with air conditioning, central heating, Sommier, safety box, frigo-Bar, hairdryer, telephone, cable TV and WI-FI. Passagers must complete the registration form (Formulario Reserva >>>) , which includes the corresponding debit authorization to make the reservation. For those who don't want to pre-pay accommodation early for any reason, in the Main Hotel, we have the first alternative, which is this beautiful hotel opened less than a year ago, with the prestige of the international hotels “Days Inn”. 100 m far to the Pasaje "Dardo Rocha". Rate per night: double room: usd 70 + Tax (21%). Triple room: 100 usd + Tax. Breakfast included. Each room has free high speed Wi-Fi internet access. Passengers who pay for their stay with credit card issued in a foreign country, showing passport, are exempt from the payment of the Tax (21%). Check-in is 2 pm and Check out at 10 am. The parking places are not fixed and are subject to availability. They will be assigned at the time of the Check In and have an additional charge of usd 15 per day. If there are no parking places availables, similar options in the area will be provided. Reservations must be requested writing to reservas@daysinnlaplata.com.ar, reporting that will attend the event, including name and surname of passengers, required room type, date of entry and exit. Pasaje "Dardo Rocha" distance: 200 meters. It is a classic foundation building in the city, located in the heart of downtown area. Surrounded by the best shopping centres and gastronomic offers. A few blocks from the House of Government, Pasaje Dardo Rocha, Teatro Argentino, Cathedral, Municipal building, etc. Classic building upstairs of the 19th century with 300 square meters. Carrara marble stairs. skylight that guarantees natural light and university atmosphere among its inhabitants. Its rooms are very spacious with floor of french pine trees and balcony that guarantee natural light. Changing rooms for men and women. Fully equipped kitchen. All rooms have heating radiator, ceiling fan, natural light, lockers, table and chairs, individual dishes, TV channels by cable, wifi, refrigerator, bed linen, blankets, towels and pillows. Rates: Double rooms: 1; u$s 30 per night and per person. Sextuple rooms: 1 u$s 20 per night and per person. This Hotel, owned by the Medical retirement fund of the P.Bs.As, managed by the international company AADESA Hotels, is already fully finished and equipped. But the negotiations with the hotel chain that is going to run it, have not yet been done. Presumably it will probably be Hilton or some of its linked brands. The opening is estimated at the first half of 2019. 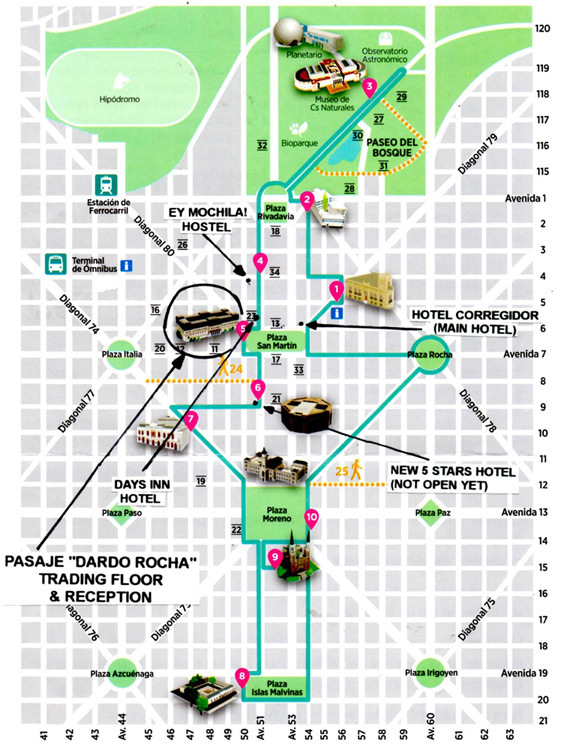 Distance to Pasaje "Dardo Rocha": 400 mts. Although not yet operating, they have made us a special rate and some references that will operate when the hotel is open. Consider that this is a top scale international hotel, and we offering it only as an alternative for those who want a differential service. Rate per night: USD 145 + Tax for the Superior rooms and extend this rate to the Deluxe rooms. As for the Suites, the rate would be USD 175 + Tax. 1) What are the differences between the superior and deluxe rooms? The difference is that the deluxe room has 2 beds of 1.40 x 2 mts each, and can accommodate from 1 to 4 people per room. 2) How many passengers held the suite? 4) How many rooms are superior, deluxe and suites? 5) Does the parking places has an additional cost or are them free of charge? They have additional cost that will be reported closer to the required date. 6) Are there minibars in all rooms?